When you travel to Bosnia and Herzegovina, be sure that you enjoy traditional dishes. Food in Bosnia and Herzegovina puts a spin on Balkan entrees and has a little something for every traveler, whether you love a good steak or you’re strictly veggie. Bosnian food can be rich, but not in an unhealthy or unappetizing way. 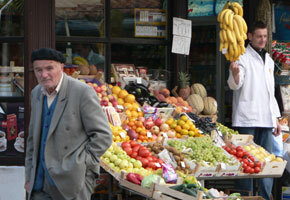 Fresh ingredients and whole foods make meals from Bosnia and Herzegovina totally appealing. Start your day with a simple breakfast. The usual morning meal is a kwizija, or hearty meal. Stock up on a variety of small courses that include scrambled eggs and bread with a spread like jam, butter, and honey. Drink a strong, traditional coffee with a dash sweet sugar, or a cup of black tea. The feature of the breakfast is a soft white cheese straight from the farms in Bosnia and Herzegovina’s countryside. If you like meat and potato courses, you’ll be thrilled with the options you will find for entree selections in Bosnia and Herzegovina. Lunch is generally the largest meal of the day, so find the most intriguing restaurant in town and indulge! Try dishes like the Bosnian bosanki lonac, a slow-roasted pot of meat and vegetables, or japrak, made up of cabbage rolls stuffed with a savory filling. If you are traveling in Mostar, try the trout, which is a specialty to the area. A buttery, flaky texture awaits, and is one option for someone who loves fish. Dinner in Bosnia and Herzegovina is generally light. You’ll probably have it after 8:00 p.m., and for Americans and the British, this may seem quite late. Pack a snack of some Bosnian sweets to tide you over, like a tiny square of baklava, normally reserved for special occasions amongst Bosnians. If you take advantage of Bosnia and Herzegovina’s surprisingly lively nightlife, try the Bosnian fast food called when you’re out late. This food may be fast but is actually quite traditional, dating back nearly 400 years! Your Bosnian cevaps, as they are nicknamed, will be made up of small sausages and chopped onions, folded in a pita bread called somun. Locally-produced wines and brandies spoil any connoisseur for choice. Sample the rakija, which is available in lots of fruit flavors like plum and grape. Besides the famous baklava, desserts often have fresh fruit and cream as main ingredients. Try the tufahijia, which is a delicious dessert dish made from apples filled with walnuts, and then topped with a rich layer of whipped cream. If you are partial to pudding, have the krempita, with a creamy, soft flavor similar to cheesecake. If you have room, you’ll want to try this delicious Bosnian food. What makes Bosnian food even better is the overwhelming sense of hospitality and warmth. You’ll be offered cookies, cakes, sweets, coffee, meat platters, and cheese samplers, and once you start sampling, you won’t be able to stop. Just be sure to save room for the main course!